Our friends at Mapbox have been doing an excellent job in becoming one of the favorite online map services, a great alternative to Google Maps. Mapbox maps are becoming even more popular following the recent price increase from Google Maps. Today we are happy to announce that we now also support Mapbox basemaps as an option when setting up TopPlace™ products. 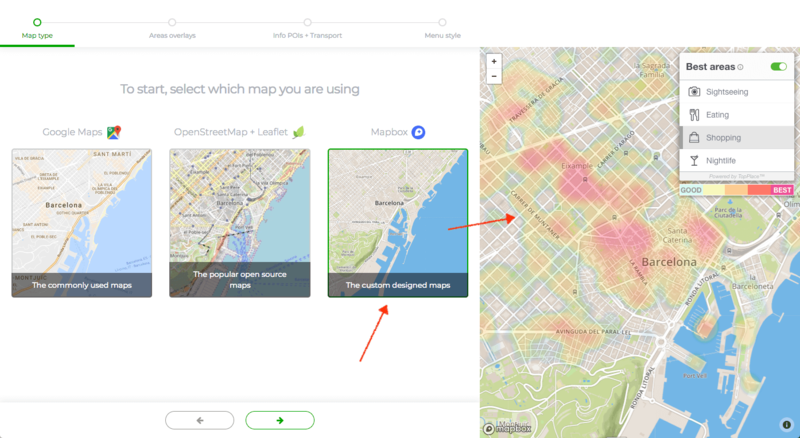 It just takes a few clicks to add Best Areas Heat Maps, Areas of Interest, Public transport lines and most popular Points of Interest to your map. By integrating TopPlace location products, any travel site can display detailed location insights for hotels and apartments worldwide, based on social media signals from travelers and locals across the globe. For example our Heat Maps and Location Scores help users identify the most suitable areas in a city, and how well a hotel or apartment is located for activities such as eating, shopping, sightseeing or nightlife. AVUXI’s TopPlace™ maps WIzard, showing popularity Heat Maps on top of Mapbox basemap. AVUXI’s mission is to save travelers’ time while making the right choice when booking a hotel. Location is a top criteria for travelers when picking a hotel. Processing thousands of pieces of information about an unfamiliar city to understand its dynamics in a limited time, is beyond any one person’s capacity. Things become more complicated as every day millions of new signals in thousands of formats and dozens of languages appear online. AVUXI searches, analyzes and filters millions of diverse signals to create a unique TopPlace score of any hotel or apartment’s location on the planet. Previous Post Flight Centre Australia signs up to TopPlace™ Heat Maps Next Post The AVUXI team is growing!